I’ve been a delinquent blogger, I admit it. But I have a good reason. I’ve been busy preparing in every spare moment I could find for an Art and Wine Walk in Abbotsford I took part in today. It was a fantastic day with 250 tickets sold and plenty of people walking through on a beautiful sunny day. The staff at Valley Realty were amazing and so helpful. They set up a tent with balloons for me outside and I had this great deck space all to myself. Artist David Boughton had set up his work inside and he kindly shared so many great tips that I’m hoping to use for my next show. I had such a wonderful day. 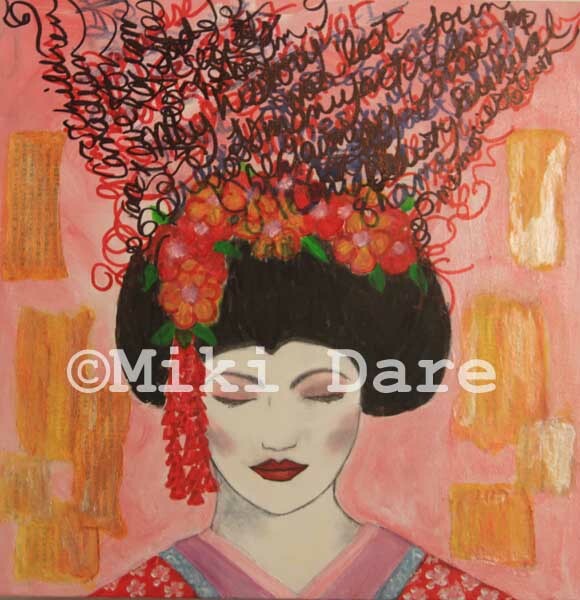 Geisha Girl Stereotype Survivor is the theme for the work I did for this show. It was really interesting to see people’s reaction to my paintings. I always enjoy the process of making my art, and I love how the finished product represents feelings and thoughts I had at the time. But, I admit that I wondered how others would perceive my artwork. Will the ideas I had in creating my pieces be conveyed to others or will they see something different? Most people got what I was going for in my work, but even the folks who had different impressions than I had intended – I still found their remarks something to reflect on. Compared to other art I have put out to the public, this was a much more personal presentation. I looked at race and gender from a personal perspective. What does it mean to be Asian and a woman in society? It was a new experience to be telling strangers straight up about my racial background and how it played into my artwork. Overall, I was impressed with how people asked thoughtful questions and were gracious listeners. My first time in the Art and Wine Walk in Abbotsford was a great success. I can’t wait until September to do it again.